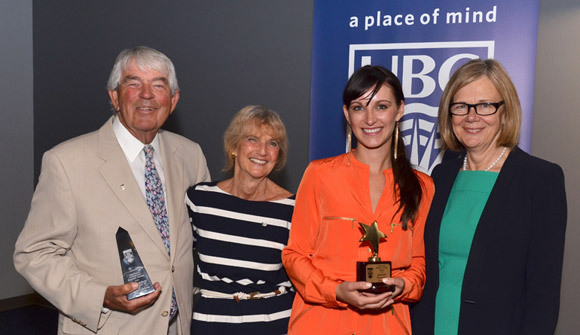 Walley and Marietta Lightbody (left) jointly received UBC’s Okanagan Alumni Community Builder Award, while UBC graduate Jennifer Forsythe (second from right) received the Rising Star Award. The tributes were presented by Deborah Buszard, (right) deputy vice-chancellor and principal of UBC’s Okanagan campus. When UBC looks to honour its alumni, you can imagine there are thousands of great candidates to consider. To be presented with the Okanagan Alumni Community Builder Award, you have to be pretty outstanding. And that’s the case with Walley and Marietta Lightbody – Kelowna residents who were jointly selected as winners of this year’s Okanagan Alumni Community Builder Award. Presented annually, the award honours Okanagan-based UBC alumni who have made and continue to make a difference locally, regionally or globally. The Lightbodys were honoured at a special event at UBC’s Okanagan campus Wednesday night, along with Rising Star alumna Jennifer Forsythe. Walley Lightbody graduated from UBC with an arts degree in 1956. Offered a scholarship from the National Broadcasting Corporation to attend Northwestern University in Chicago, he instead chose to stay in BC and study law. He enjoyed a successful legal career and remains a strong believer in giving back to his community. He is a tireless steward of his profession in both Vancouver and Kelowna, and has held many volunteer leadership roles during four decades of a busy career. His passion for the wilderness led him to establish the Save our Fish Foundation in Vancouver and to lobby governments to stop the second diversion of the Nechako River. Lightbody has numerous professional accolades and was appointed a Queen’s Counsel in 1985. Throughout the years he has kept close ties to UBC and currently spearheads a scholarship fund for Okanagan campus graduates who plan to pursue a law degree at UBC’s Vancouver campus. While he loves a good game of tennis, he has helped raise more than $600,000 for lifesaving equipment for the Cardiac Care Centre at Kelowna General Hospital though the annual Celebrity Tennis and Bocce Ball Tournament. Lightbody has not enjoyed these accomplishments alone. By his side throughout his career was his wife Marietta Lightbody, who earned her Bachelor of Home Economics degree from UBC in 1955. She, too, was presented with the Okanagan Alumni Community Builder Award. Marietta has been an active member of the Okanagan Historical Society and the Okanagan Heritage Society, and also served as a member of the Kelowna General Hospital Foundation board of directors for six years. She remains politically active with the Liberal Party of Canada, and like her husband, has been presented with numerous commendations for her years of volunteerism including the Award for Distinguished Community Service. The Rising Star Award this year was won by Jennifer Forsythe. The Rising Star Award honours graduates of the Okanagan campus who have shown to be exceptional in social, civic, professional, cultural, research and/or athletic pursuits and accomplishments. Forsythe earned a Bachelor of Science degree with honours from UBC in 2011, and this summer will defend her master of science thesis in biology. Her research in plant and soil science holds great promise for critical issues in human ecology. As an undergraduate, she published a paper examining how some fungi contribute towards improving nutrition in plants. This research may potentially change lives in Third World countries where soil fertility and food crops are often low in essential micronutrients such as iron and zinc. A dedicated volunteer, Forsythe serves as fundraising coordinator for the Women in Science and Engineering mentoring program and is social media coordinator for the Kelowna Arthritis Centre.